Tidmarsh is a 600-acre former cranberry farm near Plymouth, MA that has undergone a restoration to wetland. We have instrumented the site with an extensive network of custom low-power environmental sensor nodes, microphones, and cameras. The data from the network is made available in real time and has enabled a number of explorations into the ways that people can experience and learn from large-scale, long-term sensor installations. 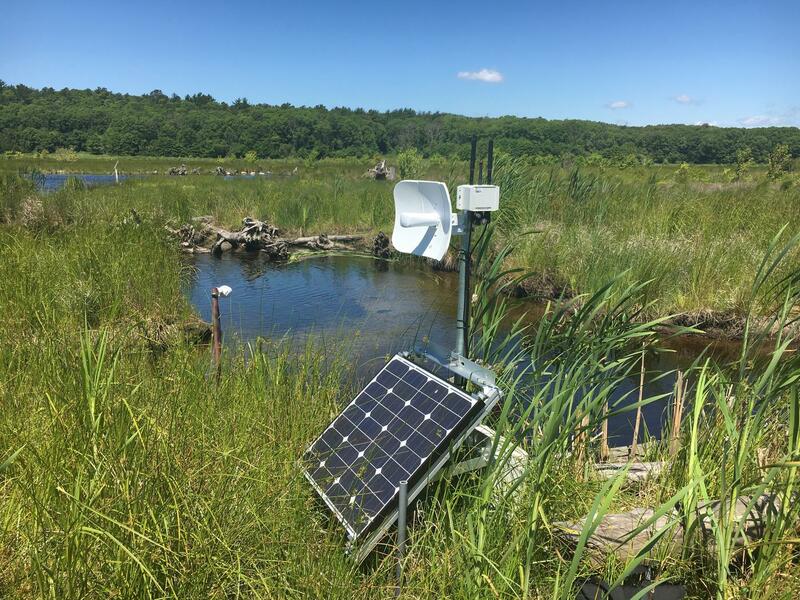 See sensor data, listen to live audio, and watch live camera feeds on the Tidmarsh website. 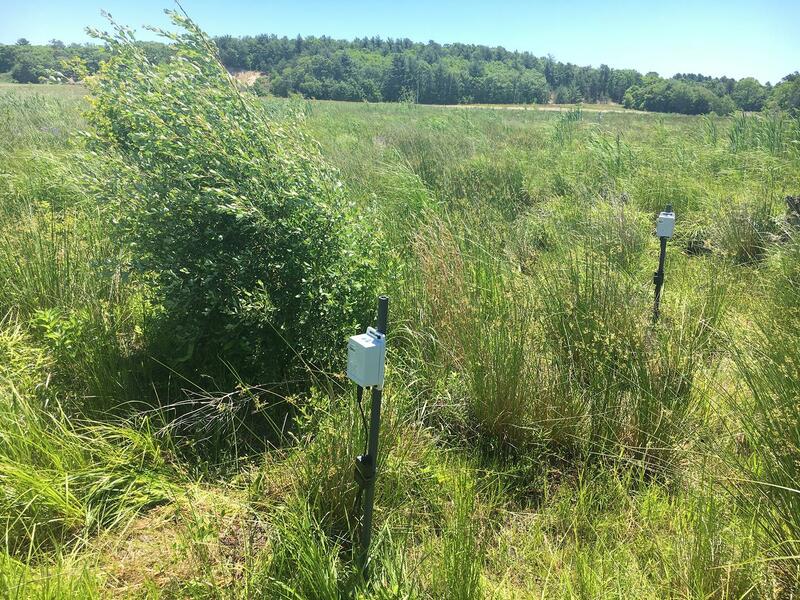 Custom low-power wireless sensor nodes monitor environmental and soil conditions at Tidmarsh. Custom wireless sensor nodes provide real time environmental and soil data. Sensors integrated into the waterproof enclosure capture temperature, humidity, atmospheric pressure, sound levels, ultraviolet, infrared, and visible light, and the motion of nearby wildlife. A connector allows the node's capabilities to be extended with external sensors, such as soil moisture and temperature probes. A rechargeable battery keeps the node powered for up to a year in darkness, while an integrated solar cell keeps the battery topped up during the day. The nodes report sensor readings every minute via a low-power 2.4GHz wireless network. A Tidmarsh base station bridges the low-power sensor network to the internet. In the background, a camera provides 24/7 live streaming video. Base stations form the bridge between the low-power network and the Internet, which is distributed around the site via directional wi-fi links (like the solar powered base station shown above) and fiber-optic cables buried in the ground. Base stations also provide connections for high-bandwidth data sources such as cameras and microphones. 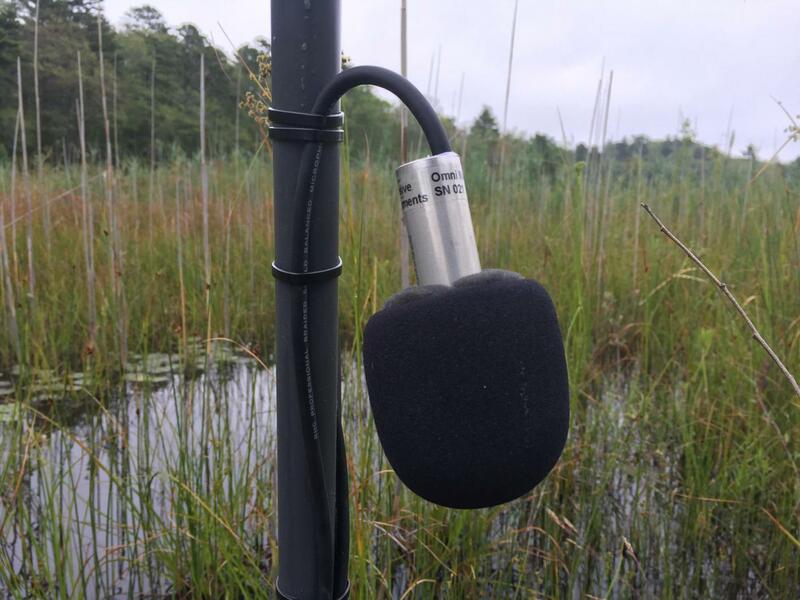 A waterproof microphone at Tidmarsh captures live audio. On part of the site, we have installed a large multichannel network of microphones, providing over 20 channels of live, synchronized audio over a radius of several hundred meters.